I received my first Kindle just over four years ago right before we moved to Africa. I was hesitant about the whole e-book thing. I love collecting books; I love the feel of the paper in my hands; I dream of creating an expansive library one day in my home and a Kindle did not seem to fit in the picture. However, after spending six months in Houston and carting a suitcase of books back and forth with me was not plausible and moving to a country where acquiring books in English was going to be impossible, the e-book was the best option. My goodness, that Kindle was a lifesaver for this perpetual reader. For the last four years, I've been lugging around that same Kindle and it has treated me well but this year for my birthday, Joe upgraded me to the new paperwhite edition . While it essentially does the same thing, it is so much lighter and smaller than its predecessor. The backlighting is really convenient (especially lately during my hours of interrupted sleep) and the touch screen is quite intuitive. Again, we chose the 3G model - when one lives somewhere with consistent internet this isn't as big of a deal but I learned in Gabon, when the internet would go out for days at a time, it was very nice to have the capability to purchase books without the connection. Taking place in the late 80s, we follow the 14 year old narrator, June, as she grapples with adolescence and her Uncle Finn's battle with AIDS during a time when not much was known about the disease. The relationship conflicts are abundant in this novel as each member of June's family deals differently with Finn's disease. While there were some moments that were a little too 'teen-y' for me and a few less-plausible plot turns near the end, I really did enjoy this book. The writing is honest and at times, heartbreaking but with enough moments of light and hope that you don't feel utterly devastated by the end of it. Be prepared for some tears though - they'll come and probably more than once. Rick Bragg is a writer who grew up in extreme poverty in the Southern United States with a father who drank far too much and a mother who worked hard to make a life for her boys despite their many obstacles. Rick chronicles his childhood and later his adulthood as he makes a way for himself in the world of journalism. I added this book to my wish list ages ago after another blogger recommended it for those who loved The Glass Castle. I loved that book and figured I would love this one too but I just didn't. Rick's life is certainly interesting, particularly his experiences as a journalist in conflict zones, yet the pace of the story didn't draw me in as much as I hoped it would. That's not to say it's not a good read - it was a fine piece of non-fiction but perhaps not the page turner I was looking for. This book has created a lot of waves - some good, some bad - the latter, perhaps, because Druckerman tends to be a little more critical of American-style parenting. While there were a few times that I earmarked pages, I didn't find the content that groundbreaking probably because I spent a couple of years surrounded by French parents and had seen many of her observations first hand. But, sociologically, I did find the book quite fascinating. While others may take offence of it's criticisms, I think it's a good read for those who are enjoy taking a step back and looking at other cultures and if anything, it highlights that we can all learn a little from each other. One sees a side of Paris we don't often hear about in The Painted Girls. It's 1878, the van Goethem sisters have lost their father and their mother has taken to absinthe. They're growing up in horrible conditions and money is desperately needed. The two younger sisters audition and enrol in the Paris Opéra hoping the meagre salary will be enough and that they'll move up the ranks in the famous ballet. The oldest sister, Antoinette, falls in love with a boy who essentially sends her life into a tailspin and puts tremendous stress on her relationship with her sister. Marie, the middle sister, begins to make her way in the ballet and with that, draws the eyes of Monsieur Degas, a painter who makes her his muse but all may not be as it seems. I enjoyed this different, dark look at the Belle Époque. The writing was quite good and the story captivating. There were moments where the plot began to drag and certainly moments where I wanted to reach into the pages and give the girls a good shake. It was, however, a bit depressing so if you're looking for something light, this probably isn't it. San Francisco in 1876, a heat wave and a small pox epidemic, a new friendship and a murder mystery make up the plot of this novel. We see a seedy side of SF as we follow main character Blanche, a showgirl/prostitute who finds her life turned upside down when she befriends Jenny. 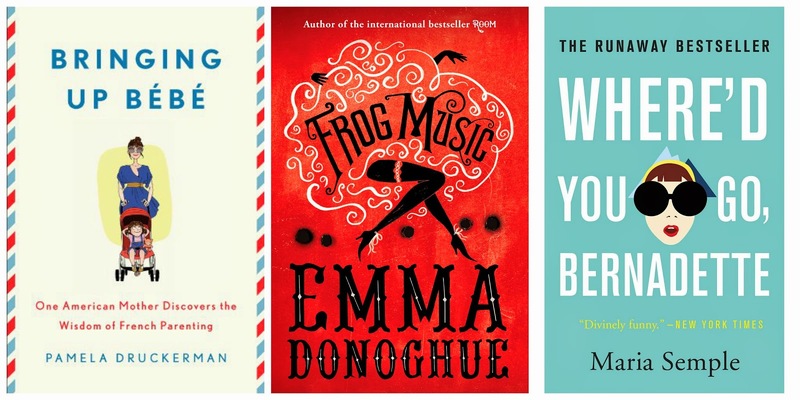 As a huge fan of Room , I was eager to pick up Donoghue's next novel but to be honest, I'm not entirely sure what my verdict is on Frog Music. I wasn't fully drawn into the story yet I didn't dislike it either. As I neared the end, I was happy to be finishing but was surprised to learn that the novel was actually based off true events. Perhaps heavy on the 'fiction' in 'historical fiction,' the research that went behind the writing of this novel is admirable. After all of the more serious (read: dark) novels, I was in need of something a little lighter and I'd seen this book recommended regularly as a great, easy read. I'm a third of the way through and quite enjoying it. Bernadette's snark and sarcasm is quite entertaining and her rant she penned to a former colleague about her home city, Seattle is hilarious. I'll probably finish this one fairly quickly - especially if my insomnia/jet lag keeps up. Update: Finished last night. I liked the first half better than the last but it was still a fun, easy read. I'm going to stick with the lighter side of things and am starting The Rosie Project this afternoon. What are you reading? Any good summer reads to pass along? 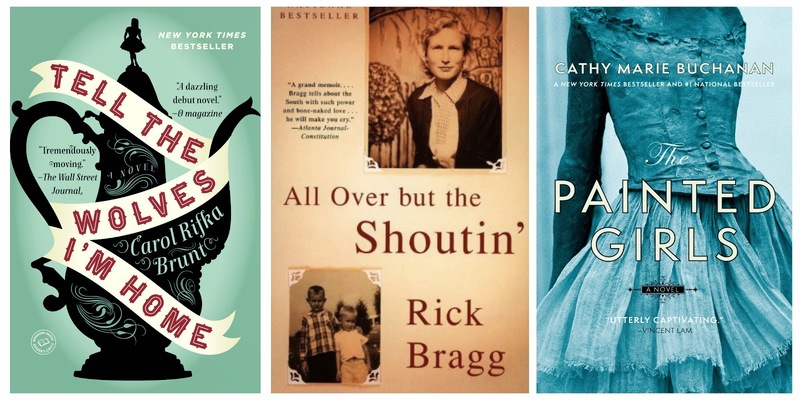 You can check out other editions of Recent Reads here. Ohhh I just finished the audiobook of The Painted Girls and it was so wonderful! I haven't got into audio books yet - I have trouble focusing without having something visual to accompany it but I certainly understand how some books can really come alive with a great narrator. I'm reading Hard Choices by Hillary Clinton right now (on vacation, of all places), mainly because it was the most interesting book on offer at the airport, but I'm enjoying it a lot so far. Obviously, non-fiction, but a great read for everyone that's interested in international politics. I've also started reading The Great Railway Express by Paul Theroux and it's a really great read. His observations and anecdotes are really informative, but entertaining at the same time. Definitely some quality travel writing! The Painted Girls sounds very interesting, I definitely have to check it out soon! I bet Hillary Clinton's book would be quite interesting - especially with a bit of a behind the scenes look. I liked the Painted Girls but felt it dragging at many times. But really interesting look into Belle Epoque Paris for sure! Yes, there were times where I couldn't put it down and then other times when I just wanted to get on with it - problems in pacing perhaps but, overall, a good read. You'll have to let me know how it turns out - sounds like it might be interesting! I've on.y heard of a few of these. I might have to read Glass Castle... You said you really liked that one right? I'm currently reading Dance of Dragons (George RR Martin). Those books are long, so I'll be on this one for a while, I think. Yes, LOVED The Glass Castle. I finished it in a day as I couldn't put it down. In other thoughts...I'm back to old fashioned book reading since back in the UK. Can't stay away from the incredible bookshops in London! I don't blame you, Jess. I have the book you gave me on the bookshelf in the living room. It's up first when I'm ready to set aside the 'summer reads.' I can feel the pages in my hands just thinking of it! I haven't read any of these yet but now they are on my list!